With the national exit poll showing Obama winning with just 39 percent of white voters, a smaller share than any Democrat since Mondale, the emerging conventional wisdom holds that a demographic tidal wave of minority turnout cost Romney the presidency. As a result, Republicans are focusing on their poor performance with the burgeoning Latino population; even Sean Hannity says he's "evolved" on immigration reform. But while the national exit poll data give the impression that Romney got the job done with white voters, Romney's stellar national performance obscures stark regional differences that suggest the GOP has its own problem with white voters. Romney’s strong national showing among white voters was almost exclusively driven by historic support from Southern and Appalachian white voters. In many counties, Obama’s performance was the worst by any Democrat since McGovern or, in some places, ever. Even a quick glance at overwhelmingly white, Southern, or Appalachian counties with a history of offering even limited support to Democratic candidates shows Obama performing anywhere from 15 to 30 points worse than Kerry did eight years ago. Obama even lost more than 50 points compared to Kerry’s performance in several “coal country” counties in southern West Virginia and eastern Kentucky. 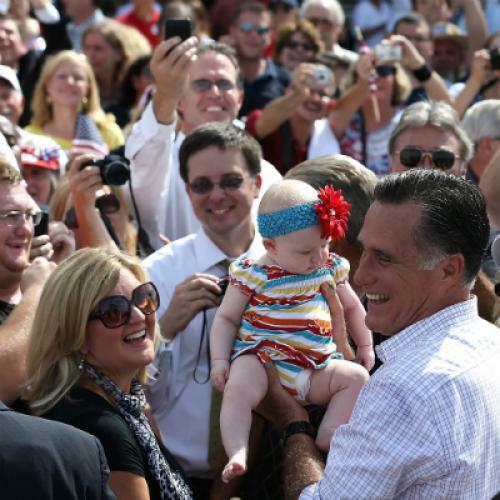 Outside the South, Romney’s performance among white voters was anything but historic. He ran behind Bush’s tallies in most of the northern half of the United States. While some believed that Obama’s weakness among white voters would translate into opportunities for Romney in overwhelmingly white states like Iowa, New Hampshire, and Wisconsin, Obama ultimately won these three states by 5.6 to 6.9 points, even though Bush never lost any by more than 1.3 points. More broadly, you can quickly consider changes in Democratic support among white voters between '04 and '12 in the nine states where whites represent at least 85 percent of the population. These states aren't exactly representative of white voters elsewhere, but the big picture is about right: outside of the South, Romney ran behind Bush among white voters, but he made up for it in Appalachia and the rest of the South. Obama also preserved many of his gains in affluent and well-educated suburban counties where many believed that Romney would perform well. Republicans won Jefferson, CO, Chester, PA, Loudon, VA, Wake, NC, and Somerset, NJ, in every presidential election from 1968 through 2004, but Obama carried all of them with the exception of Chester County, where Obama’s performance was still better than any other Democrat since Johnson. Obama also performed near ’08 levels in moderate Democratic-leaning suburbs like Fairfax, Polk, Franklin, Hennepin, or Oakland Counties. It's important to remember that the nation's best-educated counties are increasingly among its most diverse (whites were just 72 percent of the population in 37 counties without a major university where 40 percent or more of adults hold a Bachelor's degree), but it's clear from the results in relatively white counties (80 percent or more) like Jefferson and Larimier, CO, or Delaware, OH, that Obama's big gains over Kerry's performance in well-educated areas aren't just a product of demographic changes. Making matters worse for Republicans, Democratic Senate candidates ran as well as or ahead of the president in white areas in just about every competitive state, including Wisconsin, Pennsylvania, Virginia, Florida, and Ohio. The performance of these candidates suggests that the GOP's issues extend beyond specific problems with Romney or the unique appeal of the president. This particular writer can't judge whether Republicans were hurt more by abortion, tax policy, or something else, but it's clear that Romney's issue among rural, white northerners wasn't just Bain Capital, and his problem in affluent suburbs wasn't just his pledge to end funding to Planned Parenthood. If Romney's historic performance among white voters manifested evenly across the electoral map, then Republicans could justifiably consider their “demographic challenge” as their primary obstacle to victory in 2016. But the Republicans shouldn't let their national standing among white voters obscure their real challenges with white voters outside of the South. It’s not useful for Republican strategists to take solace in Obama's 39 percent showing among white voters if Obama still managed to do much better than Kerry or Gore in states like Iowa, Wisconsin, New Hampshire, Colorado, and Minnesota. In the Electoral College system, turning "lean Republican" states like Arkansas, West Virginia, Kentucky, and Missouri into "solid Republican" states just doesn't matter.